Les Voyageurs are a collection of astonishing bronze sculptures characterized by the absence of the central part of the body. The results are ethereal figures that establish a dialogue with the world around them to the point of identifying with their environment while at the same time inhabiting the space almost accidentally. This lack of matter that is "unfinished" in the style of the great Michelangelo , invites the spectators to either immerse themselves in the background, complete the design or even to wonder how can these figures possibly stand by themselves. 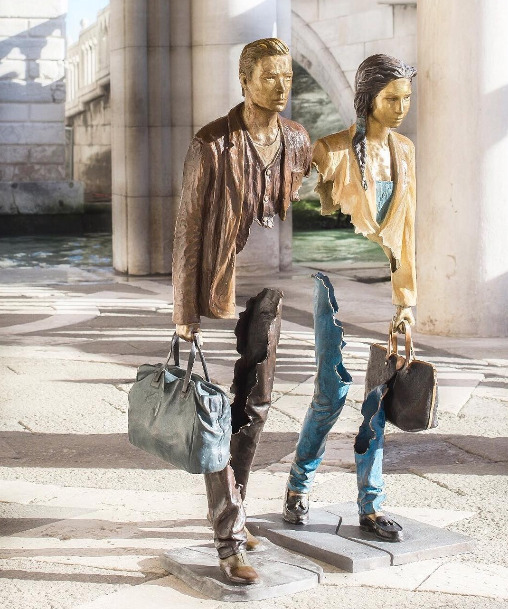 All the works by Bruno Catalano represent a "walking man", a figure that is characterized by a suitcase, a bag or a backpack that the subject holds with one hand. This represents the traveler without ever telling where he comes from or where he is going while inevitably leaving fragments of himself behind along his journey. The luggage according to Catalano - who was obliged, as a child, to leave Morocco and relocate to Marseille - are "filled with memories, life experiences, desires which in the end are my roots in movement". These bodies with their mutilated forms are able to walk but in which direction we are not certain. Maybe, as suggested by Enzo Di Martino, who contributes to the catalogue with an essay on the French sculptor Bruno Catalano: "the return is the true destination of man in this world".